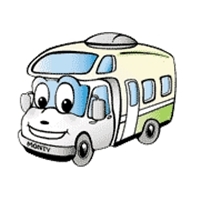 Love to travel by RV but don’t have a big travel budget? Lucky for you, we’ve found four easy ways to save big money on every RV camping trip. Use these ideas on your next RV vacation and watch your travel budget stretch in surprising ways. Most private campgrounds offer special rates, especially if you’re traveling ‘off-season’ or planning an extended stay. Do a little research on campground websites to learn when peak season ends, if they offer multi-day discounts and whether midweek campers save on the regular campsite rate. Another way to save money on campsites is to camp in state or national forests. Many offer water and electric sites at minimal cost, and the proximity to outdoor recreation can save travel dollars, as well. Oh Ranger park finder app can help you locate state and national forests and other recreation areas across the US. A third option is boondocking on public lands. You may wonder, if you normally camp in RV parks, what, exactly, ‘boondocking’ means. The term boondocking in its most basic form means camping on public lands with no amenities or defined campsites. With some preparation (filling the RV water tanks, using solar or some other alternative form of power) you can camp free in some wild and gorgeous places. To find free, dispersed campsites on public lands, check the BLM website and locate wilderness areas you’d like to visit. Call the closest BLM regional office (on the website) to make sure an area is accessible by RVs. The camping app Campendium is also a good source of information on dispersed camping areas. Ever need somewhere to park the RV and sleep before moving on down the road? Wondering if you can park an RV anywhere? The big answer is ‘No’, but there are places where RVs are welcome to park overnight for no charge. Some Walmart stores allow RVers to park in specific areas of their parking lots overnight, but you need to check with the store first. Highway rest stops and casino parking lots may also allow free overnight parking. You can use a travel app such as AllStays to search for ‘Overnight Parking’ or ‘Walmart Ask to Park’. One reason RV travel saves money is that you have an on-board kitchen to cook meals. Come up with standard menus that are RV-travel friendly. Stock your RV kitchen with staples like pasta, rice, canned sauces and beans. Buy meat in bulk if there’s significant savings and make meals ahead to freeze. Heating premade chilis, soups, sloppy joe mix, homemade pasta sauces, pre-cut stir-fry veggie and meat mixes and so forth will help you save big dollars over restaurant meals. Every RV traveler likes to save money on fuel. With today’s handy travel apps, it’s easy to find the stations with the cheapest gas along your route. Here are just a few of the top fuel price tracking apps to try. GasBuddy provides user-based reports on the latest gas prices in each area. RV travelers who help other drivers by posting gas prices have a chance to win a $100 gas gift card each month. Gas Guru posts prices provided by the Oil Price Information Service, and offers directions from your location to the cheapest gas in the area. Fuelio is a way to track mileage, fuel consumption and maintenance costs. It also displays the cheapest fuel prices based on your GPS location. If you’re one of those RVers who loves to keep a log of all costs connected to your vehicle, this is an app to consider. MapQuest app is well-known for giving travelers directions from point-to-point, but did you know if you click the ‘Nearby’ button and the gas icon, it displays current price per gallon along your route? What if I Don’t Own an RV? RV rental companies often offer specials based on season, number of days you’ll be traveling or membership in travel-related clubs. Before you rent an RV for your next trip, be sure to ask what specials are currently available. Saving money while RV camping is easy, once you learn the apps and hacks that smart RVers use. Whether it’s discounted campsite rentals or feeding your fellow campers economically, you’ll soon be saving big money on your RV camping excursions. We’ve shared a lot with our readers about the joys of visiting the San Francisco area, so we thought we’d help your planning even more by adding a list of outstanding San Francisco area RV campgrounds. Knowing you’ll find great amenities, friendly staff and easy access to Bay Area attractions can make all the difference on your San Francisco RV camping vacation. Here’s our list! Ranked among the best RV parks in the Bay Area by Woodall’s, Coyote Valley RV Resort in San Jose has something for everyone. A short drive takes you to San Francisco, great area golf courses and beautiful Monterey. While at the resort, enjoy the salt water pool, free WiFi and satellite TV, an outdoor games area and a nicely-equipped clubhouse. Across the Bay and an easy drive west of San Francisco, the charming city of Pleasanton is home to Fair Park RV. Situated on the Alameda County Fairgrounds, this park gives campers the chance to easily visit San Francisco or branch out into Livermore Wine Country. The scenic mountain setting and affordable amenities make this park a hit with our RV rental customers. Hoping to camp at the closest RV park to Golden Gate National Recreation Area? Golden Gate Trailer Park is just a few minutes north of the Golden Gate Bridge, so pull that big rig to a halt in one of their campsites and get ready to enjoy everything San Francisco has to offer. Looking for a picturesque setting outside the clamor of the city? Maple Leaf RV Park in Morgan Hill is located an hour south of the Bay Area and fits that description perfectly. Get ready to be charmed by the beauty of this large park close enough to area attractions but pleasantly away from it all. North of San Francisco in Novato, Novato RV Park is highly-rated by our San Francisco RV rental customers. Camp sites that accommodate the big rigs, nice seasonal discounts and the easy drive to San Francisco attractions are just three reasons to park your RV in Novato. An hour north of San Francisco and surrounded by stunningly gorgeous scenery, Olema RV Resort and Campground is the kind of place RVers return to frequently. While traveling to San Francisco is easy from this RV park, you’ll also find yourselves next door to Point Reyes National Seashore! Plan extra time to enjoy the wonders of this coastal RV campground. San Francisco RV Resort – Pacifica: Ocean views just a short drive from the city; what could be better while on vacation? With many pull-thru sites, full hookups including 50 amp service and free WiFi, this park will become your comfortable home-away-from-home. San Francisco/North Petaluma KOA is another area campground that receives high marks from our customers. Convenient to Point Reyes National Seashore, San Francisco and the vineyards of Napa Valley, this campground allows you to fully enjoy the region. Come home from exploring and play a game of bocce ball as you sip a glass of Napa Valley wine. Heaven! Tradewinds RV Park of Vallejo keeps you close to both Napa Valley and the high-speed San Francisco Ferry that will carry you across San Pablo Bay and on to the San Francisco Bay area. Explore the Golden Gate Bridge, the lighthouses and Alcatraz and then ferry back to your luxurious RV rental for a well-deserved rest. Another highly-rated park in the lovely town of Morgan Hill, Uvas Pines RV Park features shady campsites and friendly hosts with a quiet setting. Enjoy the convenience of camping close to Hwy 101 and come home to a peaceful night’s sleep outside the bustle of the Bay Area. Our friends at RVC Outdoor Destinations kindly shared this with us about their new campground Live Oak Landing. Nestled along the Choctawhatchee Bay with direct water frontage on the gorgeous Black Creek, Live Oak Landing is a beautiful campground committed to offering its guests a hotel-like experience in the ideal natural environment. Each one of the RV campsites is concrete, complete with full hook-ups, 50 amp service, cable and Wi-Fi. Its several century old Live Oak trees take campers back to a time when things moved at a more relaxing pace. Yet, should you feel the urge to go into town, Destin is merely minutes away with some of the best shopping and seafood restaurants in the South. If you want to bring your friends, but they don’t own an RV, no worries! There are brand-new furnished cottages to rent near the RV sites. This unique combination of seclusion and proximity are what make Live Oak Landing such a highly desirable destination. Fishing either from some excellent on-property fishing spots or through available fishing charters to experience some of the very best bayou, river, bay, and Gulf Coast fishing in the region. It sounds like if northwest Florida is in your travel plans you should be sure to add Live Oak Landing to your must-see list of campgrounds. This was kindly provided to us by our friends at Pacetti’s Campground & Marina. Pacetti’s RV Park & Marina is located at on Trout Creek, a tributary of the beautiful St. Johns River. The campground showcases the best that country charm has to offer. The 23-acre campground has huge oak trees, and the creek is perfect for fishing right off the campground’s docks. Bring your RV, tent, or even rent a cabin. The campground has a boat ramp and boat slips for your boat too. This is the perfect location to get away from all the crowds and just relax and enjoy leisurely days by the creek. When you are ready for some shopping, golf, and area attractions, everything is just a short drive from Pacetti’s. Historic St. Augustine is just one of the many attractions located near Pacetti’s RV Park & Marina. Think about taking a trolley tour, horse and carriage ride, or even a riverboat to see St. Augustine. And of course do not forget St. Augustine’s beaches! The World Golf Village that is only a 10 minute drive away. The Imax Theater, Renaissance Resort and Murray Brothers Caddy Shack restaurant are all located there. The St. Augustine Outlet Mall, a full day of shopping that is only 20 minutes away. Ft. Matanzas with guides dressed in character and real working cannons. Ripley’s Believe It or Not, always a family favorite. There are many other attractions that would appeal to visitors of all ages. The staff Pacetti’s RV Park & Marina is very knowledgeable about the area, and will strive to help you with your plans. Why do you return to the same RV campgrounds year after year? Chances are it’s because you’ve made a connection with the campground hosts there. No matter if you camp the Maine coastline or prefer plush RV resorts in Arizona, the presence of great RV campground hosts make all the difference in a memorable stay. So what makes an RV campground host great? We’ve done a little research on the topic, and identified three traits that have motorhome campers singing the praises of campground hosts. We’ve also provided links to spots where the campground hosts get rave reviews in each category. The RV campground hosts we hear good things about consistently embrace the job of welcoming weary RV travelers with a smile. And that’s not easy! Consider how busy RV parks can be in peak vacation season. That means a certain number of inconsiderate campers who want to party or run their generators all night. That means RV-traveling pet owners who don’t clean up after Fifi. But the best RV campground hosts take it all in stride. They firmly enforce their campground’s rules and accommodate reasonable requests with a smile. 3 Ponds Campground in Brentwood, NH is a great example of an RV campground where the hosts consistently get big props for friendly, caring service. From talking to RV travelers for years, we know a campground host who knows a lot about the local area can be invaluable. Here’s a stellar example of friendly, helpful RV campground hosts who can help with local travel information: KOA Yellowstone Kampground has its own Facebook page where frequent updates on ski slope and road conditions, campground upgrades, and Northern Arizona events are posted. These folks really know their local area and want you to enjoy your trip to the fullest. Sometimes the nicest things happen at RV campgrounds in the midst of emergencies. RV travelers have shared wonderful stories of campground hosts who have gone above and beyond to help get a vacation back on track. A great RV campground host really does make all the difference. We hope, when you discover one of these friendly, helpful folks (and there are plenty of them out there! ), that you’ll let other RVers know about your experience. It’s a tough job that takes a special person to host an RV park that draws visitors year after year. Our hats are off to the people who help make RV camping one of America’s favorite vacation pastimes! Many thanks to Pamela Wright of Emerald Coast RV Beach Resort, in Panama City Beach, Florida for this blog post. If you head east on I-98 from Pensacola to Fort Walton you are going to find wall to wall traffic, shopping malls and hotels. This can be quite exhilarating if you enjoy the feel of the big city stretched out along the beach, but if you would prefer a slower pace, you need to keep heading west to Panama City Beach and Panama City, Florida. You will still have the options of shopping at a modern mall, eating at an award winning restaurant and soaking up the sun on the beach – just at a more leisurely pace. At the tip of Panama City Beach lies St. Andrews State Park. A beautiful park with a lot to offer; not the least of which is the shuttle service to Shell Island. Walk along the quiet beach searching for shells, sit and relax on the white sugar sand beach, or watch the Skate (think manta ray but smaller) frolicking in the surf. Take a ride out into the gulf to watch the dolphin at play. They are beautiful creatures who give you a sense of serenity. Cross the Hathaway Bridge to visit the deceptively quiet towns of St. Andrews and Panama City. There are a lot of choices when it comes to food. Nothing quite as nice as sitting on a deck, gazing out over the lagoon and enjoying that glass of wine with a great salad. Check out the art scene, the antiques scene, and the “old” town scene along Harrison Avenue in Panama City. Lots to choose from. If you make it on a Friday evening beginning in March, you can also participate in the Friday Fest. Lots of fun, music, people watching and, once again, great food. Panama City Beach has a very active Senior Center where you can do anything from practice Yoga, to make jewelry, to paint. The price is right, the atmosphere is fun filled and you are guaranteed to learn something. Check out the theater scene! Musicals, plays, symphonies, what more could you ask for? Take a drive on I-98 heading east and visit the Forgotten Coast of Florida. Stop at Mexico Beach and visit the shops, head for Apalachicola for the freshest oysters and on the way check out the lighthouses. Be sure to visit the local seafood markets for the freshest fish, shrimp and my personal favorite…blue crab. Great taste, good for you and a whole lot cheaper than up north. Relax at Emerald Coast RV Beach Resort, one of only 17 RV parks nationwide to attain Trailer Life’s coveted 10/10*/10 rating. Just north of the Zoo in Panama City Beach, you can’t find a better place to stay. If those aren’t enough reasons for you to plan a visit to Panama City Beach and Panama City, Florida, then you will just have to wait for the next installment. See you soon! For a picture postcard perfect RV vacation this Autumn, why not enjoy both the Fall foliage and the covered bridges of New England? A journey to the historic bridges of one (or all) of the New England States gets a big boost of color in Autumn. Pack your bags as we journey East on an RV vacation to visit the covered bridges of New England. Unless you’re from the region, you may be confusing which Eastern states make up “New England.” This wonderfully scenic region consists of Connecticut, Maine, Massachusetts, New Hampshire, Rhode Island and Vermont. It also encompasses some of the most scenic backroads in America, and that’s where you’ll find the fabled covered bridges of New England. Where Will I Find New England’s Covered Bridges? For more information on Maine’s picturesque covered wooden bridges, go to Maine’s DOT website. Massachusetts Covered Bridges: You’ll definitely want to take a journey to Massachusetts when the leaves are turning, because they’ll form the most splendid backdrop imaginable for your covered bridge photos. The view is spectacular at Bissell Bridge near Charlemont, MA, Pumping Station Bridge over the Green River in Franklin County and the Upper Sheffield Bridge over the Housatonic in Berkshire County. You’ll also want to schedule time on your RV trip to see the Old Slab Bridge in Bristol County and the Sylacin Trust Bridge in Danvers. These are just a few of the picturesque spans in Massachusetts. For a complete listing by county, see DaleJ.Travis.com. New Hampshire Covered Bridges: Because New Hampshire has so many covered bridges, it’s easiest to tell you where to find information for the areas you’d like to visit! NHLiving.com offers comprehensive information about New Hampshire covered bridges by region. Just a taste—the White Mountains Region is home to more than a dozen historic bridges, like the Swiftwater Bridge over the Wild Ammonoosuc River and the Haverhill-Bath Covered Bridge in Woodsville. In the state’s Great North Woods Region, you’ll find beautifully restored bridges such as the Happy Corners Bridge near Pittsburg Village. No matter which areas you choose to visit in New Hampshire, you’re sure to find charming covered bridges to explore. Rhode Island Covered Bridges: There’s a fascinating story behind Rhode Island’s only covered bridge! The Swamp Meadow Covered Bridge in Foster, RI was built (twice!) by volunteers in homage to the state’s dismantled covered bridges. Be sure to stop by this bridge and learn about the dedication and generosity of Rhode Island residents hoping to build a monument to history. Vermont’s Covered Bridges: Did you know there’s a single county in Vermont that’s home to five historic covered bridges? From the Silk Bridge, built around 1840, to West Arlington Bridge, found near a popular Inn, Bennington County, VT is a must-see on your RV vacation to visit New England’s covered bridges. FoliageVermont.com has a full listing of covered bridges and leaf-peeping tours in the Green Mountain State. So, we’ve made it through our tour of New England, armed with some new information about where to find the area’s covered bridges. Now, how to find the best RV camping? Here’s are some links to New England campground directories. Dont miss some of our own covered bridge pictures in Monty’s RV Camping Pictures. Plan your route and hit the back roads of New England this Autumn for some unforgettable leaf peeping and the chance to visit many memorable covered bridges on one trip. Traders Village Campgrounds – Flea Markets, Fun and More. . .
For almost 40-years, Traders Village has been known as the largest, most visited weekend flea marketplaces in Texas. But, for the thousands of RV road warriors and backpackers who set up camp at the markets’ top rated campgrounds in Houston and Grand Prairie, it quickly becomes obvious that a trip to Traders Village means much more than finding that special treasure or getting twelve tube socks for $6.00. Guests staying in one of the modern 287 paved RV spaces at Houston’s Traders Village are only minutes from downtown and many of the Bayou City’s famous world class attractions. SplashTown is Houston’s largest waterpark with a giant wave pool, tubing river and slides, kid’s area and special events throughout the summer. It’s just a short drive down Highway 290 to Minute Maid Park, home of the Houston Astros Major League Baseball franchise, and the Houston Rockets at Toyota Center – always among the elite teams in the NBA. The city’s championship professional soccer and hockey teams play nearby, too. Adjacent to Houston’s vibrant Theater District is the Downtown Aquarium, an underwater experience where fishy fun and great dining come together. A miniature train takes riders through the center of a 200,000-gallon shark tank, while the Aquarium Adventure puts guests up close and personal with hundreds of species found both below and above the waves. The Aquarium Restaurant offers an exciting and unique dining experience with a menu of seafood specialties, steaks, and more around a 150,000-gallon centerpiece aquarium filled with everything from sharks to skates. The live animal adventure continues just south of downtown near Houston’s famed Museum District at the expansive Houston Zoo. “It’s a new zoo every day!” with more than 4,500 exotic animals in exhibits mirroring the natural habitat, behind the scene tours and a classic carousel like few others. Just south of downtown are two of Houston’s most popular attractions – Space Center Houston, the official visitors center of NASA, and the fun-filled Kemah Boardwalk. Space Center Houston is known world-wide for its exhibits featuring actual space craft and other artifacts from America’s greatest adventure. The Kemah Boardwalk is a great family attraction with nine restaurants, full-blown amusement rides and games for all ages. Conveniently set between Dallas and Fort Worth, the 212-site Traders Village campground in Grand Prairie makes it easy to enjoy many of north Texas’ most popular attractions. It’s just minutes to the new Cowboys Stadium and the Texas Rangers Ballpark in Arlington where you can watch professional football or baseball in state-of-the-art comfort. Professional hockey, soccer and basketball are here, too. Grand Prairie even has its own minor league baseball team – the Air Hogs. Six Flags Over Texas is filled with coasters that rock n’ roll just like the live shows found throughout the park, while Hurricane Harbor offers millions of gallons of high energy waterpark fun just around the corner. Minutes to the south of the Traders Village campground, Joe Pool Lake is great for laid back fishing, boating and waterfront dining, while to the north there is always a festival or a wine tasting going on in Grapevine, home of the giant outdoor sport retail attraction, Bass Pro Shop. But, the biggest attraction of all for Traders Village campers is the weekend flea market filled with thousands of vendors and millions of bargains. Whether looking for old tools or antiques, a new set of tires, baby clothes, a jar of homemade hot sauce or salsa, Traders Village Marketplace has it every weekend. The market’s many festivals and special events continue to draw thousands of visitors throughout the year. In Houston it might be the Bayou City Cajun Fest, Village Bluegrass Festival or Houston Championship Chili Cook-off. In Grand Prairie look for the National Championship American Indian Pow Wow, Asian Lunar New Year celebration or Mountain Man Rendezvous. No matter which market they choose, there is always something fun going on at Traders Village for campers. Traders Village RV Parks are top rated Good Sampark and Trailer Life campgrounds, and long time members of Texas Association of Campground Owners. Each facility has laundries and wireless Internet access, clean restrooms and showers, recreation hall, swimming pool, Sunday church services and more.